This section is primarily based on the research originally conducted by Jimmy Angren, Joel Arnoldsson, Johan Arvidsson, Sara Baumgarten, Sjoerd Dijkstra, Christian Högström, Cecilia Mårtensson, Matilda Nilsson, David Pettersson, Sofia Rehn, Martin Skoglund and Andreas Willman. A copy of this group's original work can be downloaded here. Lidköping has come a long way regarding creation of synergies for material and energy flows among different economic activities. Stimulated by economic, environmental and regulatory drivers, these interrelationships demonstrate a unique example of a region's progress towards a more bio-based economy by using industrial symbiosis as an important leverage. By continuing on this track, Lidköping has the potential of becoming an industrial symbiosis region of great notion. With a population of 26 000 inhabitants, Lidköping is a small town situated at the southern banks of Vänern, the third largest lake in Europe, in the south of Sweden. Lidköping houses an industrial and a harbour area, where a network of symbiotic relations have developed over the years. 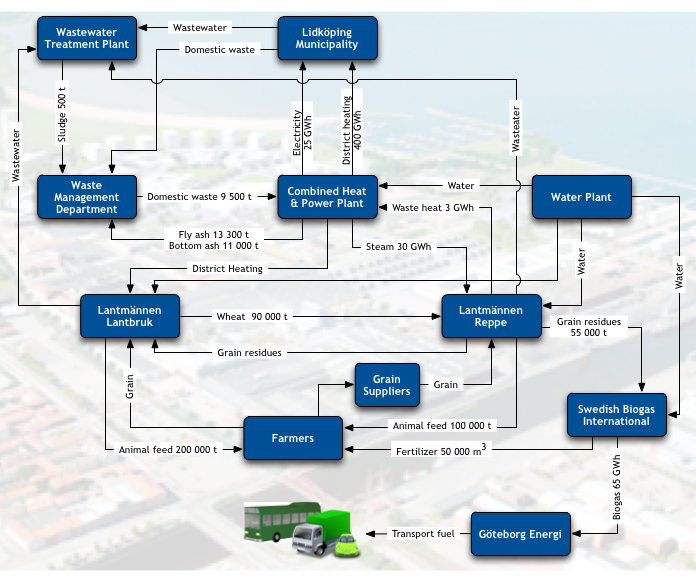 An important aspect of the symbiotic connections in Lidkoping is their contribution to the emergence of bio-based production systems that help decouple regional economic activity from the use of fossil resources. Diagram below shows some of these synergistic connections, together with the parties involved and types and annual quantities of resources exchanged among them. Additional informaton about these connections and related activities are provided further down. In Lidköping, a heating plant was commissioned in the mid-1980’s to produce heating for the city and to substitute larger numbers of smaller and polluting boilers. In 2000, this plant was upgraded to produce both electricity and heat. With its three fluidized bed and three oil boilers, the plant has great flexibility regarding fuel use. Currently, the combined heat and power (CHP) plant is primarily fuelled by wastes and by-products sourced from Lidkoping as well as from other regions and countries. In addition to producing district heating for the city of Lidköping and it surroundings and electricity, the plant produces steam for Lantmännen Reppe. The bottom- and fly-ash produced during combustion is sent to the waste management plant. A good overview of the CHP plant in Lidköping is provided in the following video. The department of waste management is primarily responsible for the collection of domestic waste in Lidköping and for operating the waste disposal infrastructure that includes a landfill, a recycling centre and a manual sorting facility. The department also collects and manages sludge from wastewater treatment and a minor fraction of industrial waste. The department mixes the sewage sludge with wood chips and sells this to the CHP plant for incineration, together with some of the household waste. Both the bottom- and fly-ash from CHP plant is then returned to the department of waste management. While the bottom ash is used as construction material in the landfill, the fly ash is landfilled. The liquid effluents from waste management is sent to the wastewater treatment plant for treatment. Lantmännen Reppe can be classified as a basic bio-refinery. Using wheat as the main raw material, the company produces a wide range of products and is constantly seeking new applications and markets for them. Currently, the main outputs are glucose syrup, gluten, ethanol, wet and dry animal feed, and raw material for production of biogas. The company requires wheat with high levels of protein and starch, which is sourced from a number of suppliers. The steam needed for the production processes is supplied by the nearby CHP plant. The residual heat from the plant still maintains a high temperature and is sent back to the CHP and is subsequently used for district heating. The relatively high quantities of water required by the plant is sourced from the municipal water treatment plant and the effluents from production are sent to the municipally operated wastewater treatment plant. The operations of Lantmannen Reppe also produce various streams of organic residues, the presence of which were a major limitation for the company in earlier days. Today, these residues are sent to local plant as substrate for biogas production and to the local farmers as fodder. The biogas plant in Lidköping was established in 2011 and is an outcome of a cooperation between Swedish Biogas International (SBI), Göteborg Energi and the municipality. The plant, owned and operated by SBI, produces biogas and upgrades it to higher purity to be used as transport fuel, which is eco-labelled (Nordic Ecolabel). While a small fraction of the produced gas is compressed and sold as vehicle fuel in a nearby station(jointly owned by Göteborg Energi and DONG Energy), the major part is send over to one of the world’s first biogas liquification plants (Lidköping Biogas – owned by Göteborg Energi and the municipality of Lidkö-ping). Here, the biogas is liquefied and afterwards distributed in the wider region to be used as fuel in heavy duty trucks. In order to meet the requirements of the eco-label, the plant only uses certain raw materials, primarily sourced from food industry in and around Lidköping. In addition to biogas, the site also produces considerable amounts of of nutrient-rich digestion residue, which is used as fertilizer by local farmers. Following video provides a good overview and further inforamtion about biogas production in Lidköping. Reductions in greenhouse gas emissions: Meeting heat and steam demand of domestic and industrial users by the CHP eliminates the need to operate larger numbers of less efficient and more polluting boilers. Significant efficiency gains are also realized by producing electricity (~35 GWh/y) in a CHP compared to conventional thermal power generation. In addition to these efficiency gains, further CO2 savings are enabled by using waste-derived-fuels, which have higher biogenic carbon content, instead of fossil fuels. According to the municipality, CO2 emissions linked to heating in Lidkoping have been reduced from 64 296 t/y in 1985 to to 4 700 t/y in 2006 – a reduction of 93%. There are additional benefits linked to the integration between the CHP plant, Lantmannen Reppe and the district heating system that enables cascading of energy and reduces overall energy demand. Further reductions of around 18 000 t/y of CO2 equivalent are enabled by the production of biogas and its use as a transport fuel, thereby substituting fossil fuels like diesel but also gasoline. Emissions of other air pollutants: Partly due to the higher efficiency and alternative fuel usage in CHP plant and partly due to advanced flue gas cleaning systems employed in this palnt–that would not be feasible to adopt in individual heating or steam boilers–significant reductions in SOx and NOx emissions were realised. More specifically, between 1985 and 2006, SOx emissions were reduced from 355 t/y to 55 t/y, and NOx emissions were reduced from 146 t/y to 8 t/y. Further reductions on emissions of trace metals, HCl and particulate matter are also enabled. Reduction in the use of fossil resources: By using waste as fuel, use of 30 000 m3 of oil is avoided by the district heating system alone. Furthermore, with the increased use of biogas, 6 500 m3 less diesel is needed in the region. In addition, with the availability of organic fertilizers from Lantmannen Reppe and from biogas producton, regional demand for chemical fertilizers is reduced. Reduction of waste landfilling: Thanks to the exchanges taking place, the amount of household waste that needed to be landfilled has been reduced by 90 000 t/y, and is instead used for the production of electricity and district heating. Domestic, institutional, industrial and commercial heat users realise economic gains as the district heating provided by the CHP plant is more competitively priced, as compared to heating produced using fuel oil in their own boilers. Using household waste as fuel in energy production has economic benefits for the CHP plant, as the plant receives a gate fee for the domestic waste incinerated. Thus, instead of paying for the fuel, which is the case for using fossil fuels, the company generates an income on the input side as well. At this stage, these benefits are not quantified. The exchange of steam and residual heat between the CHP plant and Lantmännen Reppe provides economic benefits for both parties. More specifically, Lantmännen Reppe avoids a substantial investment and operational costs linked to having its own boiler system. The CHP plant, in return, has a higher-value demand for an important by-product and has a more steady demand for the heat it produces. This makes additional electricity production feasible and reduces the need to store waste over summer months. Just like the steam and heat exchange with the CHP plant, Lantmännen Reppe realizes similar benefits by having its effluent treated by the municipal wastewater treatment plant. More importantly, by revalorizing its organic waste streams as fodder and as substrate for biogas production, the company overcames a significant production bottleneck, eliminates landfill tax and waste management costs associated with these streams, and turns these streams into sources of income. For the waste management department, incineration of waste offers a lower cost alternative as compared to landfilling. The strong position of Lidköping municipality and their environmental policies and decisions has been a key driver for the establishment of synergistic linkages (although there was no explicit industrial symbiosis purpose). The development of the CHP plant was, for example, driven by the municipal goals of: a) replacing inefficient and polluting boilers used for the production of heat in individual houses and buildings, and b) to have a better disposal option for the waste streams from the city. The policies and objectives of the municipality increased demand district heating combined with a desire to reduce the amount of waste landfilled. There were also some political motives for the continued extension of the district heating network, since the social democratic government at the time wanted to have full control over the heat production. These stimulated the cooperation between the CHP plant and the waste management department. The municipality has also played a significant role for creating a demand for biogas as a transport fuel – e.g. through having gradually higher requirements on the environmental performance of vehicles used in services for the municipality. In addition, the municipality has successfully stimulated and coordinated communication and cooperation among regional actors. For the establishment of the CHP plant, the long-term contracts with the department of waste management acted as a key enabler for large economical investment in a new boiler. It needs to be noted that the monopolies over the district heating network and municipal household waste also played an important role for making the investment in the CHP plant possible. Another important factor is linked to the fact that the CHP plant has no demands for making profits. The fact that a large part of the synergies involves actors in the agricultural business can also be considered as an enabling factor. There are a lot of elements in the traditional agriculture that can are aligned with industrial synergies. Recycling of fertilizers and a maximized use of each resource has always been keystones in every farmers business. With this in mind, Lantmännen Reppe can be considered as an anchor in the symbiosis in Lidköping, creating demands for energy and water and generating by-products and wastes that can be used locally. High intensity of agricultural and linked activities in the region is also important for biogas production, and have stimulated various synergies. Having the biogas used for transport labelled with Nordic Ecolabel has been a strategic decision by Göteborg Energi to position themselves as a environmentally responsible company and this has been instrumental in strengthening the symbiotic relations associated with the production of eco-labelled biogas. Policy tools, and in particular environmental regulations and laws that enabled new technology and fostered internal improvements have been important drivers for the development of synergies in the region. For example, the landfill tax regulations and EU’s waste hierarchy were surely key factors for finding alternative paths for organic waste streams, which led to turning these streams into fuel, biogas substrate, and input for local farmers. The governmental investment programs LIP (Lokala investeringsprogram) and KLIMP (Klimatinvesteringsprogram) have also supported the sybmiotic links by funding parts of some of the development in Lidköping. These programs supported the expansion of the CHP plant 54 million SEK (23 % of total investment) and the construction of the biogas plant by 17.25 million SEK (30 % of total investment). There are also several smaller projects funded by LIP and KLIMP which have contributed to the development of the IS network in the region by facilitating increased demand for district heating or and biogas. There are also a number of challenges in the area that might have limited the development of more synergistic linkages, and that still pose a difficulty for creating new synergies. At a generic level, due to the high diversity of industrial activities in the area, compounded by a lack of continuous dialogue among companies, actors had limited knowledge about each others’ activities. Although diversity is likely to offer a strength in the future, it is beleived that so far it has limited wider cooperation. In addition, several of the actors in Lidköping are part of larger groups of companies, with limited power to make decisions regarding their local transactions. This is a factor potentially limiting the emergence of higher number of local connections. The department of waste management Regulations and laws played have been an important driver for synergies relating to this organisation, but they also pose challenges for other options already identified. For example, the department cannot revalorize the fly ash from the CHP plant, as the laws do not permit the use of such fly ash in Sweden. Another challenge is linked to the economics of certain alternatives. The waste management department wishes to provide sewage sludge as a fuel for the CHP plant. However, economic considerations favour household waste above sewage as fuel. Besides, negative feelings among the personnel on the CHP plant regarding the sewage further impedes this particular synergy. Swedish Biogas International: Producing biogas thatconfirms with the requirements of the Nordic Ecolabel poses limitations on the operations of this company. More specifically, SBI cannot use other material streams commonly used in regular biogas production, such as rest products which still might be considered as food of any kind. This limits the potential of creating additional synergies with local actors but is not considered as a problem since the biogas plant is currently running at full capacity. It needs to be noted that with the development of district heating and a CHP plant, Lidköping has succeeded in creating environmentally favourable conditions for industries to operate in. Through green marketing and environmental awareness the municipality might attract new actors to the region creating possibilities for further synergy development. There are already some plans regarding future possible synergies in the area that are examined by the involved companies and administrations. There are also several possibilities that were discovered by the authors during the field work and that could be of interest for further investigation. Some of these plans and possibilities are outlined below. The sludge produced in the waste water treatment plant could be used as fertilizer for agricultural production. The sludge has a high content of phosphorus, which is a finite resource, and the recirculation would reduce the need for commercial fertilizers. However, this is not a straight–forward option as sewage sludge can also contain high levels of heavy metals and residues of pharmaceutical products. Due to these concerns its application on agricultural land is restricted by regulations. The safety of the material will need to ensured prior to such applications. There will also be a need to have awareness campaigns for the farmers, who are generally reluctant to use sludge due to its origin. Another possibility is to build a separate waste water treatment plant for the waste water which originates from industrial production. This would create a pure fraction of sludge that shouldn’t face the same reluctance as the municipal sludge. Lantmännen Reppe is currently sending its waste water to the municipal waste water treatment plant, and by building an own waste water treatment plant the company could sell the sludge for biogas production and use the remains as fertilizer for agricultural production. This expansion would reduce the strain on the municipal waste water treatment plant, and create the same environmental benefits as for the municipal sludge. However, today there is no shortage of capacity in the municipal waste water treatment plant, and the exchange may not be favourable from an economical perspective. The department of waste management is currently examining the possibility of separating household waste into organic and combustible waste fractions and processing the organic waste into biogas. To assist this, the department is investigating the possibility to build an optical sorting facility in cooperation with other munici-palities. Furthermore, the region contains several food distributors and manufacturers who are able to supply a large amount of waste which could be used for production of biogas. As the eco-label requirements does not allow household or food manufacturers waste as inputs, the department of waste management and food manufacturers would have to send the organic waste outside the local area or build a new plant. Another opportunity could be to add a production line at the existing local biogas plant which would produce biogas that is not labelled. Unfortunately this requires a large investment and it creates the risks of odour problems. Additionally, SBI’s current building permit does not allow this kind of expansion. Separating the household waste will reduce the amount of waste that is available for combustion in the CHP plant. The remaining combustible waste fraction, on the other hand, will be dryer and provide a better energy exchange. However, if the household waste is replaced by combustible waste in a greater magnitude, this would require a modification of the boiler. A possible synergy is to use the fly ash as an input in cement production. This would reduce the amount of waste landfilled and avoid the environmental problems associated with conventional clinker production. However, fly ash contains heavy metals and this kind of synergy is not possible today due to regulations. In order to use fly ash in cement production the legislation needs to change. The change could lead to economical and environmental effects, both for the cement factory and the CHP plant. One possible synergy is to connect the biogas plant to the district heating system, mainly by using the condensate and waste heat from the processes. The gas pipelines need to be heated, which is currently done by using electricity, but it would be possible to either connect it to the district heating or to use waste heat. The use of district heating would reduce the electricity used, hence creating an environmental benefit and reducing the cost. There are two setbacks for this expansion: it adds to heat consumption when the demand is high and it is a large investment. As noted earlier, there are many food processing companies in the region with organic waste that could supply raw material for biogas production in a new plant. Another linkage with the food processing companies can be established by developing greenhouses that can utilize carbon dioxide from the CHP and biogas plants, low grade heat, and organic fertilizers. These greenhouses could, in turn, provide the local food industry with raw materials. This could create a region known for its sustainable food and energy production.